BNL’s Madison Webb and the Stars will face a defensive challenge from No.8 Center Grove in the opening game of the Class 4A regional at BNL on Saturday. BEDFORD – Home is where the trophy is, and there’s no place like BNL Fieldhouse as Bedford North Lawrence prepares to defend its Class 4A regional championship. Two heel clicks during a whirlwind day for a title. 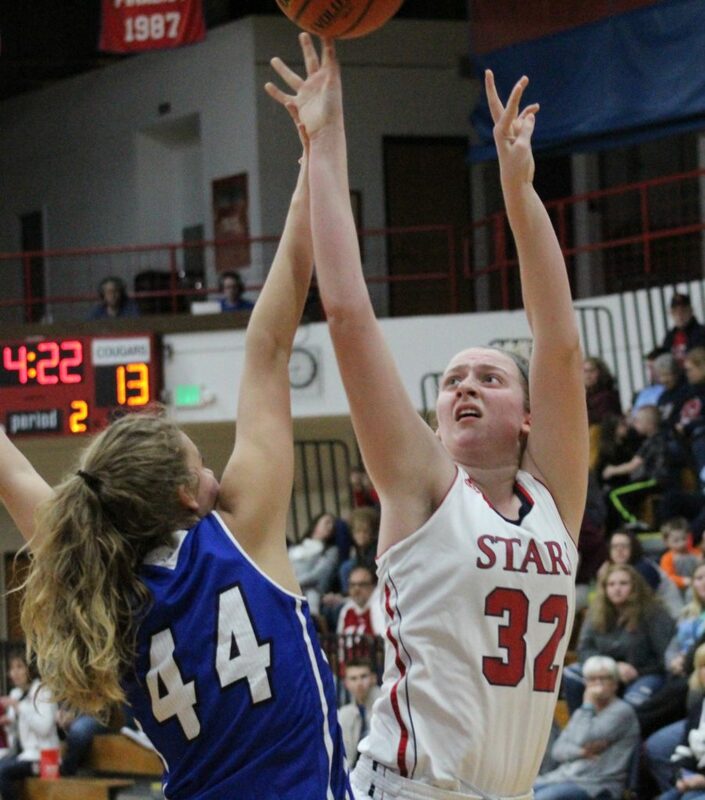 The Stars, surging toward peak performance at the perfect time, will grace Damon Bailey Court on Saturday morning in the opening game of the state tournament’s second stage, facing No.8 Center Grove in a rematch of last year’s epic championship battle. After BNL (22-5) and Center Grove (22-3) clash at 10 a.m., No.9 Bloomington South (21-3) will collide with Castle (21-4) in the second semifinal. 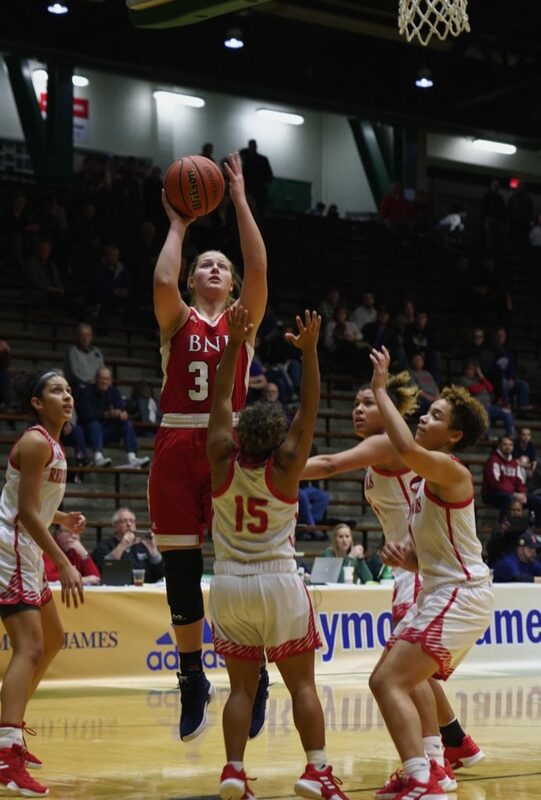 Those two survivors will return for the final at 7:30 p.m.
BNL has played its best basketball during this postseason push, dominating the sectional at New Albany while winning three games (against opponents that had 47 combined wins) by an average of 17.7 points. Preaching patience and calmness, BNL coach Jeff Allen believes his team is poised to climb even higher. The reason for his optimism and excitement is directly linked to BNL’s recent ability to showcase its interior power. Jorie Allen, the Indiana University recruit and Miss Basketball candidate, and Madison Webb have been the focal point. The results have been obvious. BNL’s Jorie Allen powers her way to the basket. Allen leads the Stars in scoring (18.9) and rebounding (7.9). Allen (18.9 points, 7.9 rebounds) and Webb (8.7 points, 7.0 rebounds after averaging in double figures during the sectional) give BNL a powerful post attack. That opens up perimeter gaps for Chloe McKnight (9.5) and Jacy Hughes (7.3), and makes the Stars extremely dangerous and difficult to defend. If any team is equipped and built to do that, Center Grove certainly is. The Trojans, one of the state’s top defensive teams, allow only 38 points per game, and nobody has hit 60 on them this season. Only five teams got into the 50s. That style worked well as the Trojans went on an 18-game winning streak, ended by Lawrence North in the regular-season finale. Center Grove bounced back with impressive victories over Martinsville, Whiteland and Franklin in the sectional. Veteran guard Emma Utterback averages 12.6 points per game for Center Grove. “Our girls have been consistent,” Stuckmeyer said. “They bought into the defensive philosophy and worked hard to make other teams earn it. 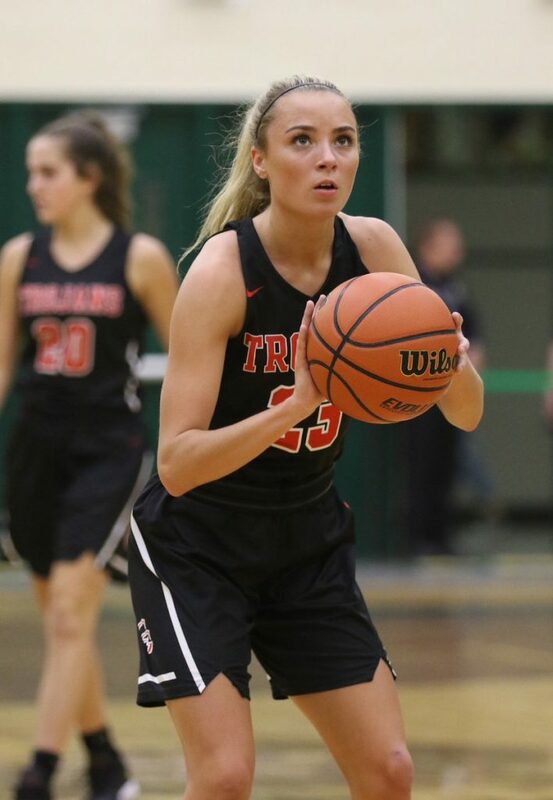 Center Grove features the backcourt experience of Ella Thompson (13.4 points), Emma Utterback (12.6) and sophomore newcomer Mary Wilson (9.9). The contrast of styles – compared to BNL’s paint power – will create an explosive battle. “They’re really solid defensively,” Allen said. “They get out in passing lanes, they put pressure on the ball and don’t let you make the entry pass. That’s good coaching and kids playing with a high level of effort. This rematch will have to hustle to match last year’s tremendous tournament bout. 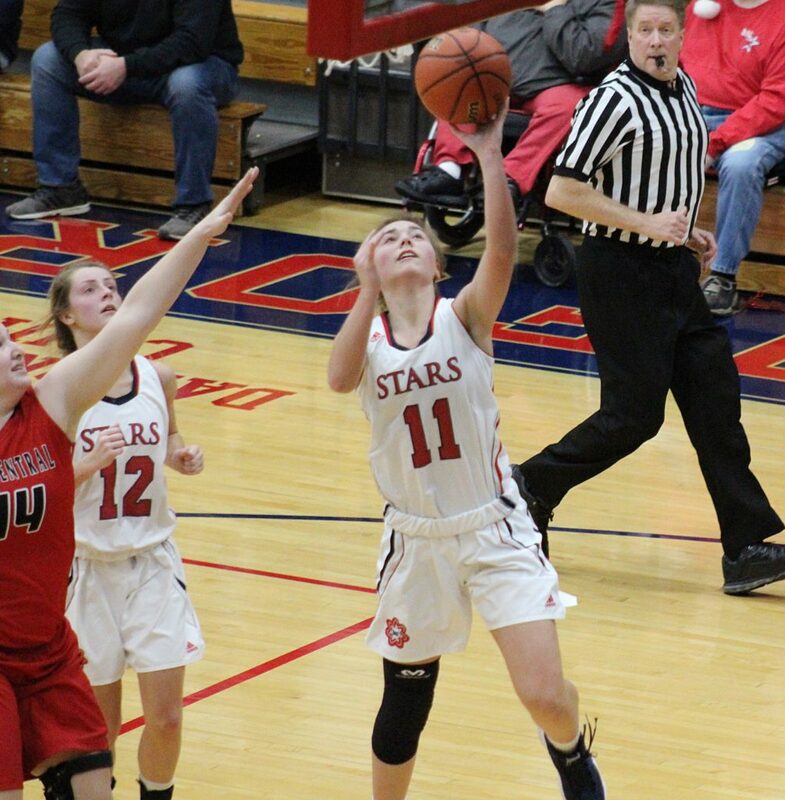 The Stars escaped with a thrillling 46-44 win when McKenzie Messmore hit a last-second shot from the lane, sending BNL dancing into the semistate and sending Center Grove home with the bitter memories of a jilted wallflower. Picking a favorite among these four is almost impossible. The Sagarin computer power ratings favor Center Grove, but the Trojans have never won in BNL Fieldhouse. Whoever wins the opener will find another difficult challenge in the championship. “I think it will be an outstanding regional,” Allen said. “It will come down to kids making plays, which is what is great about the state tournament. That’s the fun part. Center Grove is chasing its first regional title since 2007. The Trojans, motivated by revenge for the tears they shed last season, beat BNL during the 2015-16 regular season but are 0-2 against the Stars in the postseason. The champion will advance to the one-game semistate, at either Jasper or Jeffersonville, to meet the regional champion from Decatur Central on Feb. 16. The IHSAA will announce all the semistate sites on Sunday. BNL’s Chloe McKnight averages 9.5 points as an important 3-point threat. Last meeting: Last season, the Stars won the regional title at Columbus with a thrilling 46-44 victory over Center Grove. Jorie Allen scored 15 points and McKenzie Messmore hit a last-second shot to power BNL to its 12th regional title. Cassidy Hardin scored 14 points for the Trojans. Game notes: Center Grove has won four regional titles in program history, the last in 2007. BNL is 2-0 against the Trojans in postseason play. The Stars also conquered Center Grove 60-44 in the 2015 regional semifinal at BNL. F – Emily Rake 5-8 Jr.
F – Kylie Storm 5-10 Sr.
G – Mary Wilson 5-10 So. G – Emma Utterback 5-8 Sr.
G – Ella Thompson 5-7 Sr.
G – Jacy Hughes 5-7 Sr.